With Practice Ignition, your invoices can be automatically sent to Xero and your jobs sent to XPM. To have your invoices show in XPM, you will need to enable the Xero invoice import function in XPM. In XPM, go to Business > Settings > Xero. If you have not authorised your Xero account yet, you will need to authorise your connection, more information on these steps can be found on Xero's help site here. 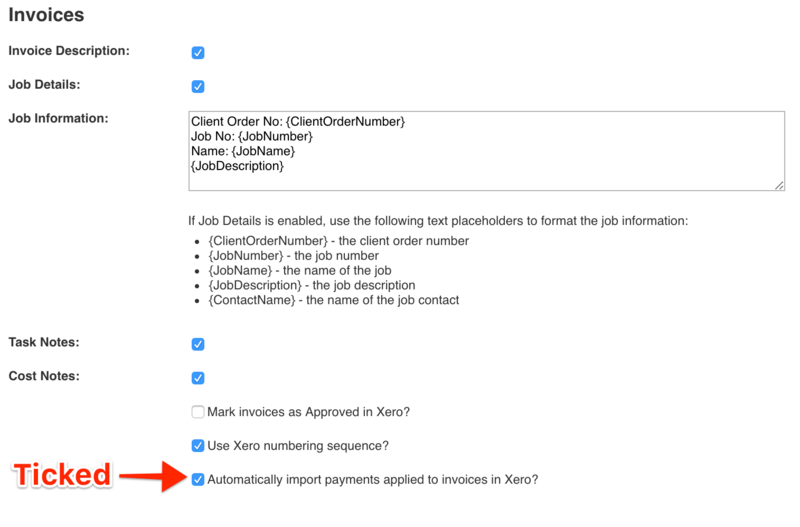 Ensure 'Automatically import invoices from Xero' is ticked and 'Create an Ad hoc job when no current job matched the Xero reference field' is not ticked. If you are using Practice Ignition payments and you want payments to import as WIP credits into XPM, ensure 'Automatically import payments applied to invoices in Xero' is ticked. Payments will import as negative WIP credits into XPM to be balanced against your time spent when you do a WIP washup. See this article for more information on WIP washup. If you need help troubleshooting some common invoice import problems, see our article on Troubleshooting Invoice allocation in Xero Practice Manager.